Connects to an external data source in the same Azure subscription. Optionally, integrates optical character recognition or natural language processing for extracting text from unstructured data. Generates an index based on data sampling and metadata of the external data source. Crawls the data source for searchable content, serializing and loading JSON documents into the index. The wizard can't connect to a predefined index or run an existing indexer, but within the wizard, you can configure a new index or indexer to support the structure and behaviors you need. New to Azure Search? Step through the Quickstart: Import, index, and query using portal tools to test-drive importing and indexing using Import data and the built-in realestate sample data set. This section explains how to start the wizard and provides a high-level overview of each step. In the Azure portal, open the search service page from the dashboard or find your service in the service list. In the service overview page at the top, click Import data. 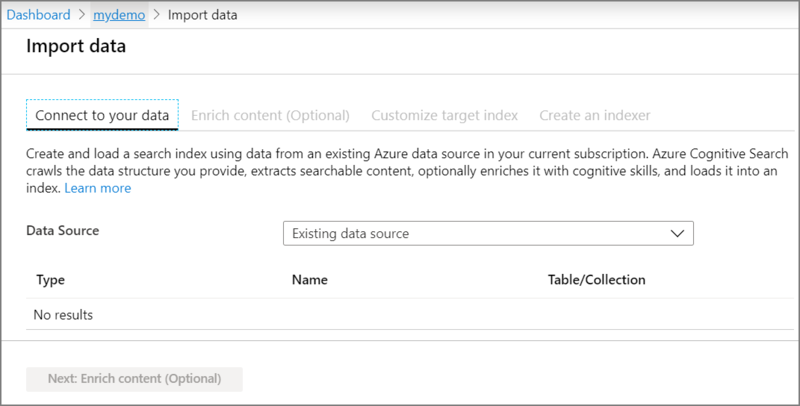 You can launch Import data from other Azure services, including Azure Cosmos DB, Azure SQL Database, and Azure Blob storage. Look for Add Azure Search in the left-navigation pane on the service overview page. The wizard opens to Connect to your data, where you can choose an external data source to use for this import. There are several things to know about this step, so be sure to read the Data source inputs section for more details. First, attach a Cognitive Services resource to an Azure Search skillset. Second, choose which AI enrichments to include in the skillset. For a walkthrough demonstration, see this Quickstart. If you just want to import data, skip this step and go directly to index definition. Next is Customize target index, where you can accept or modify the index schema presented in the wizard. The wizard infers the fields and datatypes by sampling data and reading metadata from the external data source. For each field, check the index attributes to enable specific behaviors. If you don't select any attributes, your index won't be usable. Next is Create an indexer, which is a product of this wizard. An indexer is a crawler that extracts searchable data and metadata from an external Azure data source. By selecting the data source and attaching skillsets (optional) and an index, you've been configuring an indexer as you move through each step of the wizard. Give the indexer a name, and click Submit to begin the import process. You can monitor indexing in the portal by clicking the indexer in the Indexers list. As documents are loaded, the document count will grow for the index you have defined. Sometimes it takes a few minutes for the portal page to pick up the most recent updates. The index is ready to query as soon as the first document is loaded. You can use Search explorer for this task. A flattened dataset is a required input. You can only import from a single table, database view, or equivalent data structure. You should create this data structure before running the wizard, and it must contain content. Do not run the Import data wizard on an empty data source. Existing data source If you already have indexers defined in your search service, you can select an existing data source definition for another import. In Azure Search, data source objects are only used by indexers. You can create a data source object programmatically or through the Import data wizard. Samples Azure Search hosts a free public Azure SQL database that you can use to learn about importing and query requests in Azure Search. See Quickstart: Import, index, and query using portal tools for a walkthrough. Azure SQL Database Service name, credentials for a database user with read permission, and a database name can be specified either on the page or via an ADO.NET connection string. Choose the connection string option to view or customize properties. The table or view that provides the rowset must be specified on the page. This option appears after the connection succeeds, giving a drop-down list so that you can make a selection. SQL Server on Azure VM Specify a fully qualified service name, user ID and password, and database as a connection string. To use this data source, you must have previously installed a certificate in the local store that encrypts the connection. For instructions, see SQL VM connection to Azure Search. Cosmos DB Requirements include the account, database, and collection. All documents in the collection will be included in the index. You can define a query to flatten or filter the rowset, or leave the query blank. A query is not required in this wizard. Azure Blob Storage Requirements include the storage account and a container. Optionally, if blob names follow a virtual naming convention for grouping purposes, you can specify the virtual directory portion of the name as a folder under container. See Indexing Blob Storage for more information. Azure Table Storage Requirements include the storage account and a table name. Optionally, you can specify a query to retrieve a subset of the tables. See Indexing Table Storage for more information. The Import data wizard generates an index, which will be populated with documents obtained from the input data source. For a functional index, make sure you have the following elements defined. One field must be marked as a Key, which is used to uniquely identify each document. The Key must be Edm.string. If field values include spaces or dashes, you must set the Base-64 Encode Key option in the Create an Indexer step, under Advanced options, to suppress the validation check for these characters. Set index attributes for each field. If you select no attributes, your index is essentially empty, except for the required key field. At a minimum, choose one or more of these attributes for each field. Retrievable returns the field in search results. Every field that provides content to search results must have this attribute. Setting this field does not appreciably effect index size. Filterable allows the field to be referenced in filter expressions. Every field used in a $filter expression must have this attribute. Filter expressions are for exact matches. Because text strings remain intact, additional storage is required to accommodate the verbatim content. Searchable enables full-text search. Every field used in free form queries or in query expressions must have this attribute. Inverted indexes are created for each field that you mark as Searchable. Sortable allows the field to be used in a sort. Every field used in an $Orderby expression must have this attribute. Facetable enables the field for faceted navigation. Only fields also marked as Filterable can be marked as Facetable. Set an Analyzer if you want language-enhanced indexing and querying. The default is Standard Lucene but you could choose Microsoft English if you wanted to use Microsoft's analyzer for advanced lexical processing, such as resolving irregular noun and verb forms. Select Searchable to enable the Analyzer list. Choose an analyzer provided in the list. Only language analyzers can be specified at this time. Using a custom analyzer or a non-language analyzer like Keyword, Pattern, and so forth, will require code. For more information about analyzers, see Create an index for documents in multiple languages. Select the Suggester the checkbox to enable type-ahead query suggestions on selected fields.